When I first set eyes upon this tiny fast food wonder of technology, I could just eat it up. Now, upon a closer inspection...I'm not feeling fully satisfied. Yes, this mini vacuum in its cheesy burger get-up is too cute! No doubt, it looks hilariously funny, zooming around your home picking up all the crumbs and dog hair. My one pickle? It reminds me totally of that robot round vacuum that is sold on infomercials, touted to be the best floor sucker around. Ahem....it is *not*. Someone very near and dear to me bought one. Without me knowing. It's horrible! Gets stuck under the couch, finds itself pinned into a corner... and it drives your pets mental. So yes, the mini burger is adorable but if it's anything like that *other* round vacuum "miracle", just don't plan on it getting the job done right. *sigh* I always hated hamburgers anyway. 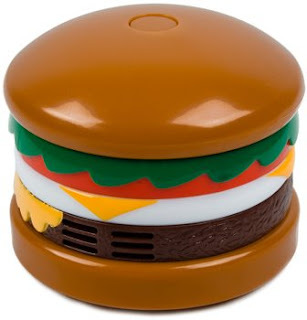 I've wanted a burger phone since my watching 'Neighbours' days, but a burger hoover?? No thanks. Plus it would mean actually hoovering, which I'm not a fan of. Yeah I disapprove. Although the hamburger phone on Juno was really cute.